Learn the Arthroscopic subtalar fusion with Orthosolutions Large Fragment(TCS) cannulated screws surgical technique with step by step instructions on OrthOracle. Our e-learning platform contains high resolution images and a certified CME of the Arthroscopic subtalar fusion with Orthosolutions Large Fragment(TCS) cannulated screws surgical procedure. 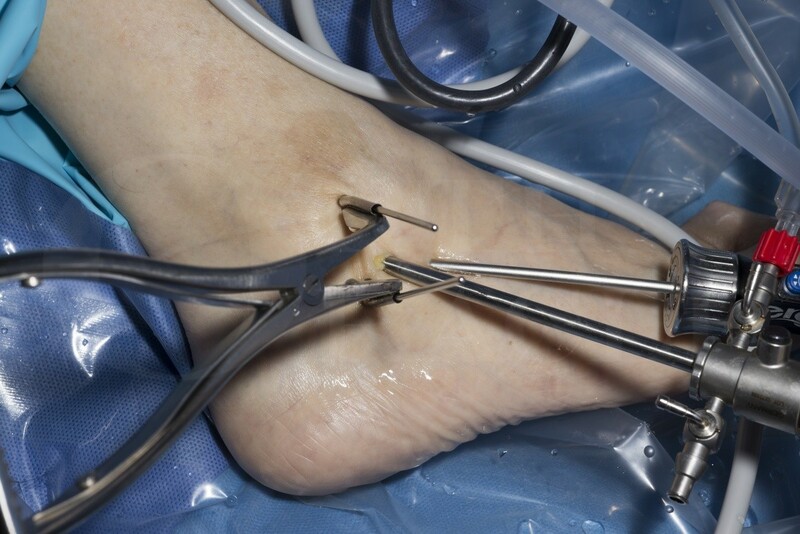 Arthroscopic subtalar fusion may be performed to treat subtalar pain due to arthritis, instability , and deformity – when this is passively correctible. In common with other arthroscopic fusions, it preserves the tissue envelope, with perceived advantages of rapid and reliable union. It is particularly useful in cases with poor lateral skin due to valgus deformity, burns or previous scars. The Orthosolutions titanium cannulated screw system provide the surgeon with a comprehensive range of large screw diameters and pitch lengths with excellent on-table compressive performance. They make dealing with a multitude of fixation situations during subtalar fusion as straight-forward as it can be and are what I have come to rely on. Institution :The Nuffield Orthopaedic Centre , Oxford ,UK.